Perennial forage production is a primary source of grazing and hay for livestock producers throughout the United States, including Alabama. Because forage production is dependent on weather, producers are subject to continual uncertainty about future forage yields and quality. Strategies to manage risk include forage diversification, improved soil fertility, and grazing management. In addition, a relatively new insurance product is available to assist forage producers in managing precipitation risk. The Pasture, Rangeland, and Forage (PRF) Insurance Program provides subsidized insurance protection for perennial forages produced for grazing or harvested for hay in the United States. It is administered by the United States Department of Agriculture (USDA) Risk Management Agency (RMA). PRF insurance has been available in Alabama since 2009. As of 2017, approximately 5 percent (roughly 121,000 acres) of the total pastureland in the state was enrolled in the program (see figure 1). PRF is designed to help producers offset replacement feed costs when low rainfall causes reduced forage production. PRF is a single peril insurance product, meaning it is triggered only by low precipitation relative to a chosen coverage level. It is important to note that PRF insurance is not directly linked to actual forage yields or livestock performance. Still, the program has value to livestock producers who depend on forage production. PRF is a rainfall index insurance program, which means it uses an index of precipitation for a local area rather than actual precipitation for any single producer’s location. These local areas are defined by grids of 0.25 latitude by 0.25 longitude, which equate to approximately 12 by 12 miles at the equator. These lines do not follow county lines or town boundaries (see figure 2). 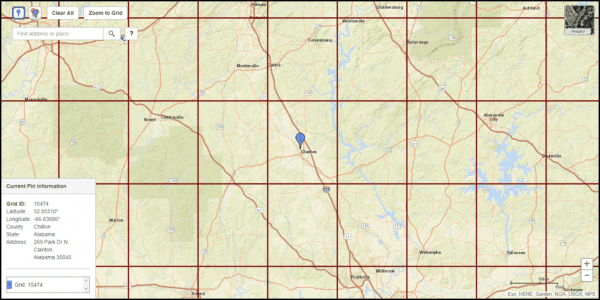 Individual policies are based on the specific grid in which pastureland is located. Rainfall index values are calculated by a weighted average of the four closest National Oceanic and Atmospheric Administration (NOAA) weather stations. Historical index values also are calculated for each grid and are used as the baseline level for the program design. Index values are calculated for eleven 2-month periods, referred to as index intervals. The intervals are January/February, February/March, March/April, April/ May, May/June, June/July, July/September, September/ October, October/November, and November/December. Because the program uses grids and an average of precipitation from nearby stations, rainfall at any single location could be different from the rainfall index calculation for an index interval. Indemnity payments (the amount of money you collect) are determined by the current year’s rainfall index compared to the historical average index value for a chosen 2-month period and coverage level. For example, if a producer chooses a 75 percent coverage level, an indemnity payment is triggered if the rainfall level is less than 75 percent of the historical average (that is, a rainfall index value of less than 75) for his or her grid and index interval. Number of insured acres. Producers must choose the number of acres to insure. Producers do not have to insure all of their forage acreage. Intended use. 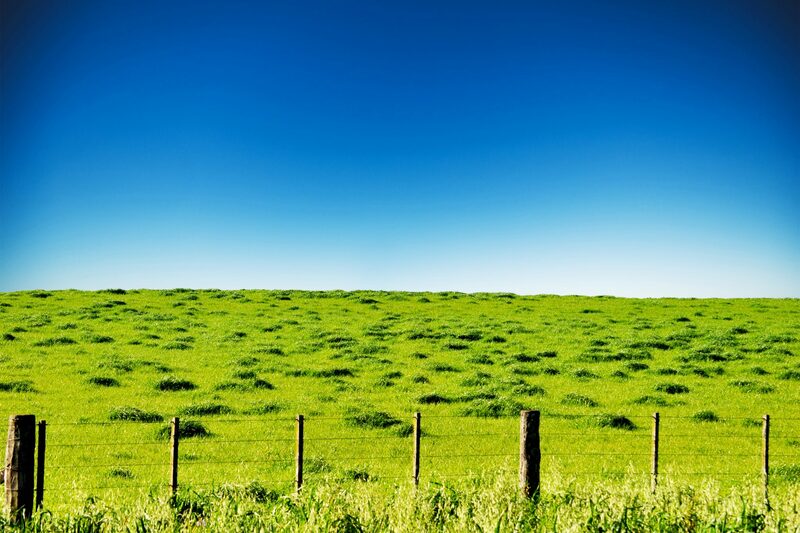 Producers must choose between haying or grazing as the intended use for the acreage. Grazing acres have a lower premium cost but also lower potential indemnity payments than haying acres. Irrigation and organic practices. If producers choose haying as the intended use, they must also choose whether the acreage is irrigated or not and whether the acreage is Certified Organic. Coverage level. The coverage level is the rainfall index level at which an indemnity payment is triggered. Possible coverage levels are 70, 75, 80, 85, or 90 percent. Higher coverage levels have higher premium costs. 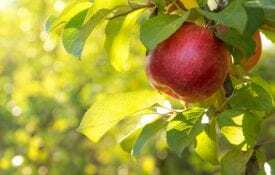 There are different premium subsidy levels (the portion of your premium that the Federal Crop Insurance Corporation will pay). Subsidy levels range from 51 to 59 percent, with the lowest coverage level (70 percent) receiving the highest subsidy level (59 percent). Productivity factor. Producers can adjust the covered value of their forage by adjusting the productivity factor to be between 60 to 150 percent. A county base value of production is provided by the RMA for each county. The productivity factor adjusts the coverage level relative to that base value to best represent a producer’s coverage preference. Together, the decisions on coverage level and productivity factor determine the dollar amount of protection. 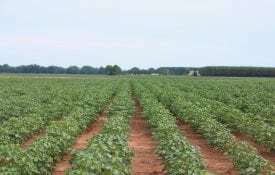 For example, if the county base value is $100 per acre, a coverage level of 90 percent and productivity factor of 125 percent would result in a dollar protection amount of $112.50 per acre. 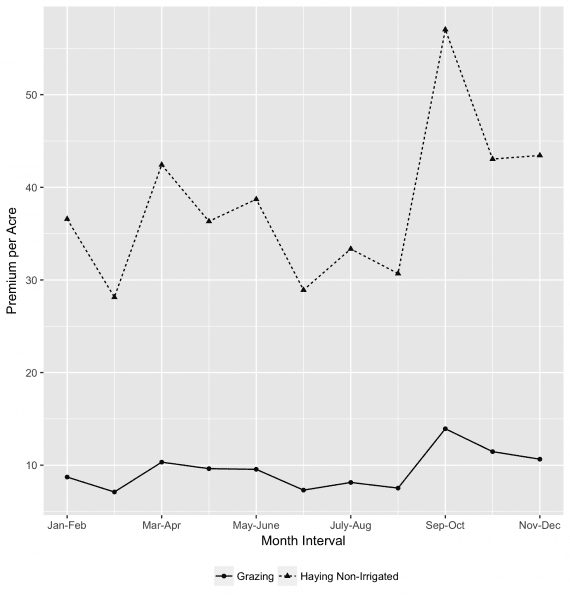 Two-month index intervals and percentages of value. The crux of the PRF insurance lies in the choices of coverage levels and 2-month intervals. Producers must choose 2-month intervals in which they want to insure against low rainfall. For example, if a participant chooses 90 percent coverage and January/February and March/ April intervals, an indemnity is paid if the rainfall index in either January/February or March/April falls below 90 percent of its historical average. Participants cannot choose overlapping intervals (for example, March/April and April/May). The participant must also place a percentage of value into each chosen interval. The percentage of value would likely reflect the ranking of the intervals that matter most for forage production. Figure 3 indicates the percentage of enrolled acreage in Alabama in each 2-month interval in 2017. 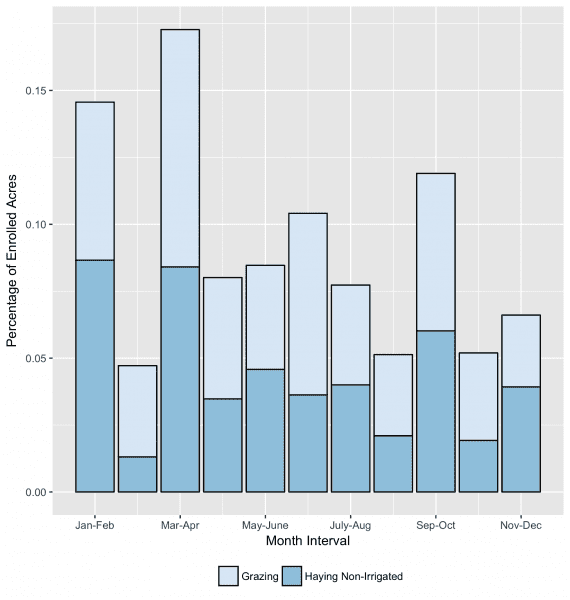 The most popular intervals were January/February, March/April, and September/October. the highest premium per acre across both grazing and haying acreage, while the February/March interval had the lowest per-acre premium on average. There are trade-offs with choosing the per-acre value and coverage levels. The higher the coverage level, the higher the cost of the insurance, and higher the chance of a collected indemnity. Similarly, the higher the per-acre insured amount, the higher the cost of the insurance, and higher the potential indemnity amount. The USDA Risk Management Agency provides more information as well as an interactive decision tool at www.rma.usda.gov/policies/pasturerangeforage. This tool can be used to search for grids, explore policy options and costs, and plot out historical rainfall indices and policy outcomes. PRF insurance can be purchased through any authorized crop insurance agent. The enrollment deadline for each year is November 15 of the prior year. The premium payment deadline is September 1 of the following year, so premiums do not need to be paid up front. 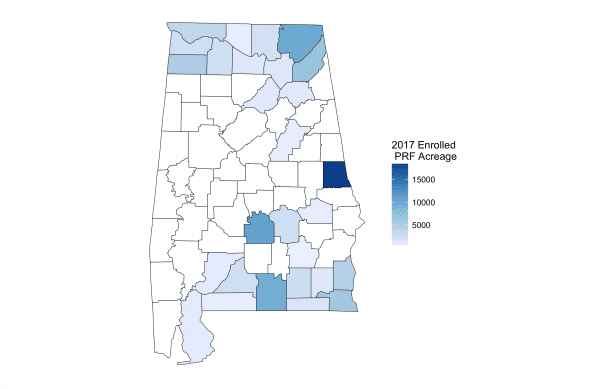 PRF insurance is a subsidized insurance product that has potential advantages for forage producers in Alabama. It offers a chosen level of protection against the loss of precipitation. Because the premiums are subsidized, the producer cost of this insurance coverage is reduced. PRF is not a sufficient risk management strategy on its own. 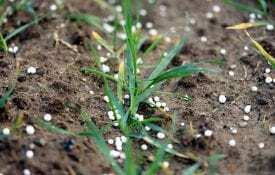 It should be utilized along with other risk management practices, such as forage diversification, improved soil fertility, and grazing management. Download a PDF of Forage Risk Management: Subsidized Insurance as a Strategy, ANR-2495.